Up and out early, we made our way out of the gated community of Tuscan Hills and I spotted an animal running past through the bushes – I pointed it out and said “is that, an armadillo? !” ON closer inspection, it was! He was moving ever so fast, but managed to get a photo of him – marvellous! Then we were on our way to Animal Kingdom! Homer (our sat nav) decided to take us down a service road for some reason, and after farting around, we eventually found our way to Animal Kingdom. We parked up and took a photo as usual to remind us where we parked our car so we could find it at the end of the day (Unicorn) and hopped on the tram to take us to the entrance. We got there in time for what I presume is the rope drop? there was a truck with Mickey, Minnie and Pluto telling us to make sure we have our maps and then, I’m pretty sure they sang a song too, well, my diary tells me so – right now I can’t remember! 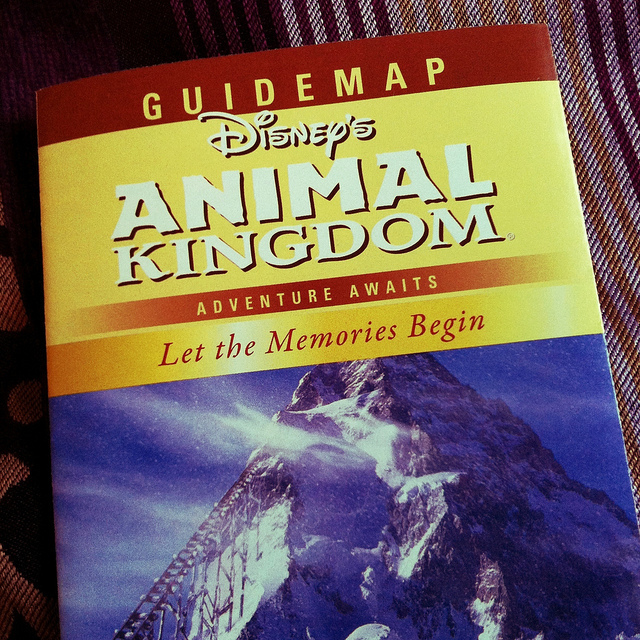 So, taking their advice, we grabbed our map and walked in the direction of Tusker House for our breakfast reservation. We got here earlier than our ADR time, so I sent Steve off to go and get some Fastpasses for Kilimanjaro Safari. The return time was 10:30 – enough time for us to have brekkie and get over to the ride. Liam and I wandered about and I took some photographs of the surroundings. Eventually it was time for breakfast, and first up was a photo with Donald Duck. You’re not allowed to get his autograph and I felt a little upset about this (how very sad!) and also, he wouldn’t be joining the guests in the restaurant, which make sense I suppose as he can’t be out front taking photos AND walking around the dining room – duh! They do take pics with your own camera though, but the guy didn’t focus my iPhone properly, but we also had one taken with our Lumix, so not all was lost! After a photo and signature, we took ourselves off to the buffet. Our first port of call at the plentiful buffet was a Mickey waffle that I so desperately wanted after seeing them on a TV show about Walt Disney World! Liam LOVED the tater tots and came back with his plate piled high with them! Steve,as usual, piled his plate high with as much as possible – I don’t know where he puts it all! As I said, the buffet was plentiful, and this is me we’re talking about, so here are some photos I managed to take whilst juggling my plate! Daisy Duck was next to make an appearance, she signed our autograph book and posed for a photo. In our book, I put a sticker of each character that I thought we would meet and it was cool to see the character’s reactions when they saw a pic of themselves. We then took another look at the buffet – always wanting to get our money’s worth! Whilst eating, Goofy entered the room, banging a tambourine and getting all the little kids to follow him around, playing instruments. He wasn’t very happy if the big kids (read: adults) weren’t clapping along, so we made sure to do so, so that he wouldn’t have the hump! He then disappeared before coming back a short while later to pose for photos and sign autographs. I made one last trip to the buffet for some dessert…dessert – at breakfast time? Oh America, you’re so crazy! I had some banana bread – it was delish! Tusker House was excellent – the food was, I felt, much better quality than that at Hollywood & Vine (our other Disney dining experience so far) and the atmosphere was better too – helped by the characters I think. The area around the buffet was nice and open with plenty of space – I felt cramped in H&V and all round, for us, it was a nicer experience at Tusker House. The waitress kept our drinks topped up and we didn’t feel rushed with the characters. And whilst it was an expensive breakfast at around $86 for the 3 of us, I thought it was well worth it and would definitely come back here again. Pretty full up, we headed over to Kilimanjaro Safaris for our Fastpass return. I’m so glad we did this early in the day as there were a lot of animals out and about. Our tour guide was informative and the experience just re-affirmed my wish of doing a safari out in Africa some day. From a plus size rider view it was fine – it is bench seating with no seat belts to worry about. Had to stop for these horny guys as they were blocking the road. We had a near altercation with some rhinos who were coming way too close for comfort and the rangers had to corral them away from the safari truck before we could complete our tour. Then some ostrich also decided to get in on the act! Once our tour was over, we took the Pangani Forest Exploration Trail with a lovely, non-crowded view of the gorilla. We then decided to board the Wildlife Express Train to Rafiki’s Planet Watch. …where we met and was photographed with Rafiki, Jiminy Cricket and Pocahontas. An animal keeper then came out with a ferret and talked about this animal for a while. We sat and listened for a bit before returning back to the train. How time does fly when you are in a theme park! By now it was after twelve and we wanted to see the Festival of the Lion King. Knowing that this was pretty popular, we went to line up for the show. A very hot queue with random fans only hitting certain parts of the crowd, and not much in the way of shade at that time of day. Made worse by announcements to fill all available space, so people were cramming in…the show (as most things in Disney parks I’ve found) was worth the horrid queue though. Very impressive. I LOVE the Lion King, especially the music and this different spin on it was wonderful. There is some audience interaction as well, and with everything going on all around you, I can only say that this is a must see show. The Circle of Life is probably one of my favourite Disney songs, it gets me every time…Here is a video I took on my iPhone of that song – the woman has an amazing voice. With the dark theatre, fast action and only my iPhone (as Steve was taking video with our camera) these pics aren’t all that, but I’ll throw them out there! On the walk out of this area, Lilo & Stitch were signing autographs and taking photos – there was a small queue, but we HAD to meet these guys – I love them! This is one of our photopass pics. Stitch was just awesome, well they both were, really played their characters well with Stitch “licking” me and giving me hugs (too cute!) and Lilo telling him off for being naughty. After photos, we headed over to ‘It’s Tough To Be A Bug’ which had the longest queue area/walk to the theatre. The ride itself was a walk-on, so we grabbed our glasses and sat down, waiting for the show to start. Realising it was nearing Mickey’s Jammin’ Jungle Parade time, we went to go and grab a spot near Asia. They were roping off the area, so we sat on a bench behind it and waited. Black clouds and thunder started to roll in, and the grim realisation that the parade may be cancelled set in. I asked a Cast Member and they said it hadn’t been cancelled…yet, so we continued to hang around and popped into the gift shop. Eventually the announcement was made that the parade was to be cancelled due to the weather conditions…gutted! We never did see this parade as we didn’t make it back. So with a heavy sigh, we moved into Asia. I tried the test seat out in the meantime, and the Cast Member said I would be fine – at least I would know for when we ride it…which sadly, we didn’t (sob). So, continuing through, we went to watch the last showing of Finding Nemo – The Musical. Another fab show! Loved it! The production was brilliant and the costumes especially so. I know some find it weird that you’ve got the puppeteers on the stage holding the characters, but you almost zone out on them – at least I did! I think it helps a bit if you’ve watched the movie (and guess what? I love this film too!) and I would happily watch this show again. We didn’t take many photos – really hard on both cameras, and to be honest, I was more interested in just watching and enjoying the show than snapping away. Hubs did do a short video right at the end. Animal Kingdom is a park of epic proportions and we seem to have spent today getting from one place to another. Park closing time was now edging closer, so we went back through to Asia to see if Expedition Everest was open – it was, but a 50 minute wait, and Liam didn’t really want to do this, but wanted to do Kali River Rapids instead, so that’s where we went. KRR had a short queue and we hopped on. Plus size guide – lap belts which I was fine with. We rode with an American family and had a great time. We rode the rapids twice over with them and we all got drenched! Had our waterproof camera with us, so took a video of them getting soaked first time out! We slopped back to the exit as the park was now closed. Steve picked up our Donald Duck photo which we had bought at breakfast time and had been sent to the entrance for pick-up, whilst Liam and I watched the closing song from Donald, Minnie and Goofy. A tram back to our car to dry off (we brought towels to cover the leather seats in the car – they came in very useful!) and a drive home for a dip in the pool before a snack for dinner and hitting the hay. All in all, whilst we didn’t do everything here, we did most things we wanted to. Expedition Everest and Dinosaur (which we didn’t even see!) were the two things I’m most gutted about missing out on, and I would say that this is definitely a two-day park. We did go back and re-visit Animal Kingdom on our very last day in Orlando, but it was really a flying visit, so didn’t do too much I’m afraid to say. We all really enjoyed this park and can’t wait to go back one day.